Horseback Riding, Canopy Tour, & Volcanic Mud Spa. Borinquen is located in Rincon de la Vieja National Park. 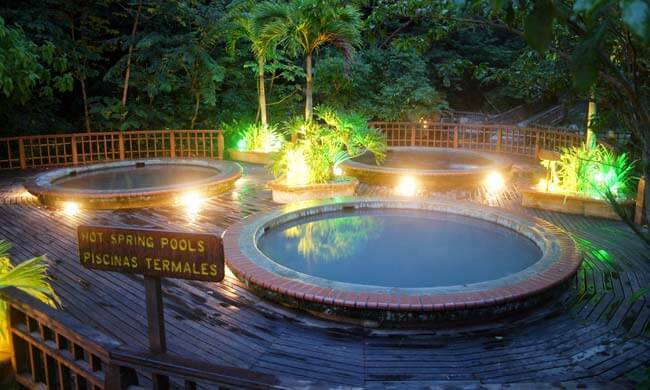 This resort is near the base of Rincon de la Vieja Volcano and sits in an untouched part of the transitional forest. If you’re looking for excitement, nature, and relaxation all rolled into one day, this is the place to be. Start the day with a horseback riding trip over the mountain, enjoying a 40-minute ride that takes you through the forest to get to the canopy. The next part of your day is zip lining on a canopy tour. Borinquen’s canopy lines are the highest in Guanacaste, so they are great for thrill seekers. Before leaving and after lunch, you’ll be able to indulge yourself in a mud bath followed by a dip into thermal waters. Treat yourself to a one-of-a-kind experience! This tour includes: Horseback riding, bilingual guide, canopy, mud bath, hot springs, lunch.